This room, next to the Roman Baths, was another social heart in Bath in Georgian times – it’s where the upper classes came to ‘take’ the hot spa water. Today it’s a fancy restaurant and café. The room itself is still magnificent, but you certainly pay a premium price to eat here. You can walk through the room for free by entering via the way in next to the Roman Baths gift shop and walking up the side of the room past the fountain where Bath spring water is located. If you do want to sample the food, it can be really busy even at times of the year when Bath doesn’t seem to have many tourists around. We’d recommend booking in advance if you can. 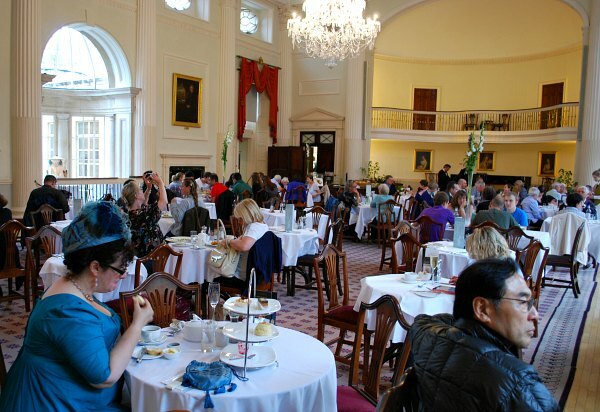 Also if you want to sample the food and enjoy the room, but not pay for a full main meal consider taking ‘Afternoon Tea’ which is much more reasonable. This is an extract from our free Bath City Guide. One of the nice things about eating here is the atmosphere. 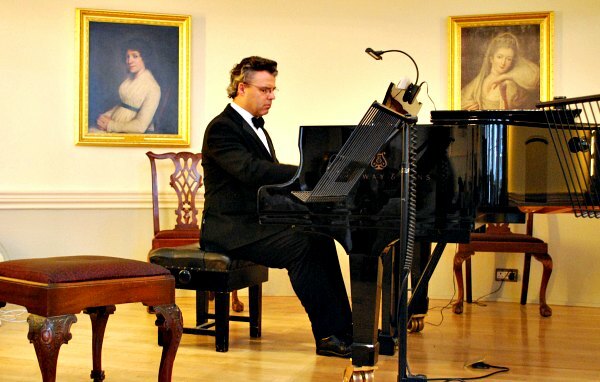 The dinner-jacket-wearing pianist performs grand pieces of classical music or memorable tunes from the musicals while you munch away on your food. It’s not unusual to see people who’ve dressed the part either and are wearing evening wear themselves, or even Georgian dress! (see below). If you haven’t booked, then you may still be able to get in to eat, but at busy times of the year there can be a long wait. The food entrance is the one right next to the main entrance to the Roman Baths. Talking of the Roman Baths, if you want to see one of the bath pools for free, you can great a great view from balcony of the Pump Room. Just walk into the corridor that links the Pump Room and the Roman Baths shop and the door to the balcony is normally open. Just step out and you have a birds-eye view of the bathing area beneath your feet. 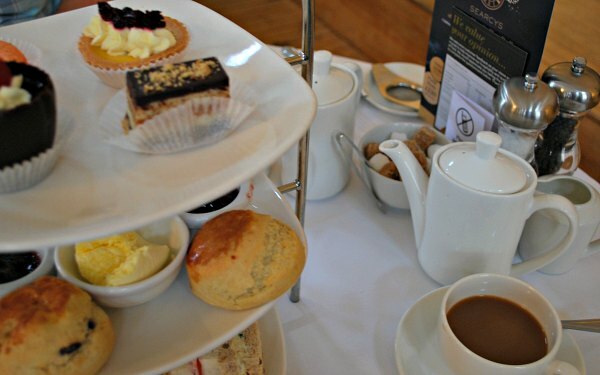 The Pump Room is open for Morning Coffee from 9.30am to 12 noon, for Lunch from 12 noon to 2.30pm and for Afternoon Tea from 2.30pm to 4.30pm. All tea packages are also available from 12 noon however. 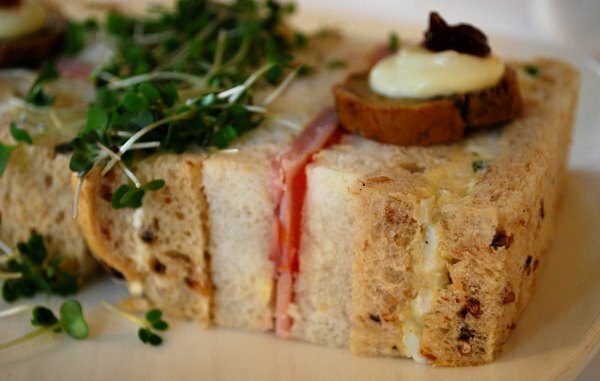 In July and August the Pump Room opens until 9pm serving dinner. 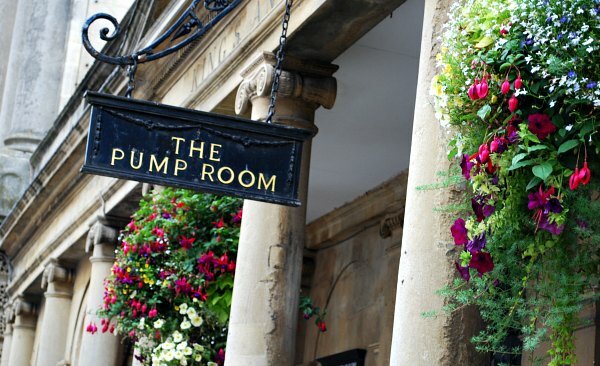 The Pump Room entrance is located next to the Roman Baths in the historic Abbey Church Yard right in the centre of Bath. The Hop on, Hop off Bus Tour stops right by the Abbey which is next to the Baths. Address: The Pump Room, Stall Street, Bath, BA1 1LZ.